I heard there was a ghost town on the island but no one gave me any details so I imagined the Wild West. One my way to the beach I missed the turn and ended up in Maunaloa. But it was a weird Twilight Zone episode because while everything looked new, no one was around and everything was boarded up. I almost expected zombies to start creeping out with the smell of new flesh. Okay maybe it wasn’t that bad but it was weird. The only thing that was open was a kite shop so I stopped in. I was in a modern day ghost town. 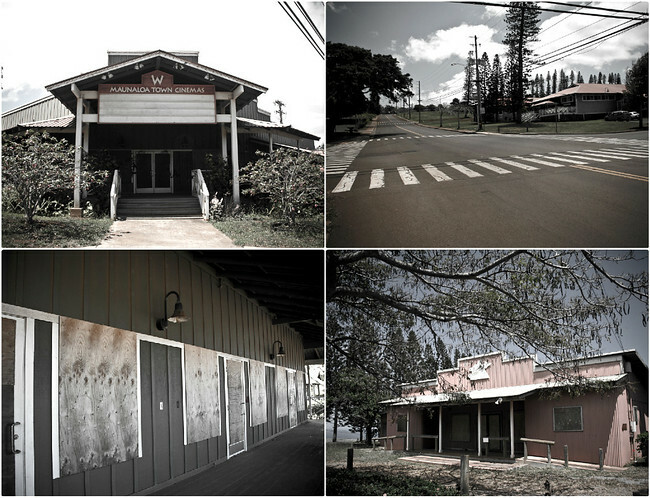 Maunaloa was the site of Molokai’s only luxury accommodations, home to a gas station and the island’s only cinema. As I mentioned in my last post Molokai Ranch, owned by a Kiwi company, wanted to continue development but the community was concerned that its plans were too aggressive and urged them to focus on the current property. That wasn’t in the plans for Molokai Ranch. In 2008 things came to a head and the two groups could not come to an agreement so Molokaì Ranch shut down completely and abandoned the island. With 120 employees it was the largest employer on the island. They were all left unemployed and the village was boarded up. Disclosure: I was a guest of the Moloka’i Visitors Bureau but all opinions remain my own. No one asked me to write a favourable review or desaturate the photos in this post. Looks like a squatter’s paradise! That’s crazy! I was wondering if there were actually any ghost towns left in the US! I wouldn’t have thought there were any in Hawaii. Interesting! I think there were Zombies. They were just being shy. You’ll have to go search for them. I love spots like this. I’m so glad you found it and shared it here – I had no idea, and if I ever go there – I’d go to see it. I hope another company with a less aggressive agenda takes over someday, but if not, I hope they leave it there forever and ever. Your photos really capture the mood of it. The photos are very surreal. It’s bizarre to see an empty ghost town that is still so modern. It looks very post-apocalyptic. I think I would be a little creeped out if everything was boarded up as well. I wonder what will come of this place in the future. This does look like an episode of the Twilight Zone (incidentally my hubs and I have been hooked on that series) and it’s a bit of awesome as well. The B&W photos are edgy and mysterious! I grew up on Vancouver Island where there are several ghost towns that I frequently explored. The creepiest were the ones where houses still had dishes in the cupboards and clothes in the closets, total alien abduction feeling. I always find derelict buildings interesting. I would be very keen to actually go to a proper ghost town like that! What a shame. I can understand the concern about rampant development, but to see businesses close up like this when there’s still such worldwide unemployment is heart-breaking. That is truly weird! I am expecting that there were Zombies or any kind of ghosts. There are some situations like that and it’s sad to know that it happens to them. Ghost towns are fascinating but I never expected one in Hawaii. Creepy! Strange and sad. And how odd that all that’s still open is a kite shop? Interesting place. Definitely reminds me of a Twilight Zone episode. Surprised someone hasn’t bought the land or something…or is it not for sale? Interesting. You’d think some locals may want to do something with this abandoned town. Or maybe they don’t want it since it was developed and owned by outsiders? hmmm. That does seem like a weird little town. Interesting that the only shop in town is a kite shop. I wonder how much business they do. how sad!! I’ll bet there are a ton of obake [ghost] stories from the locals about that place! I’ve never been to Molokai, that boarded up ghost town is bizarre. It’s also sad for such a small island to lose 120 jobs. Wow, really creepy. But I guess I’m also glad that development stopped. The land in Hawaii is so precious and should be protected from over-development. Interesting. It’s too bad that building was started and then stopped…such a waste of materials, etc. So eerie! But, to be honest, this sounds exactly like Santa Cruz! Now *that* was one eerie place to wander around in. Really is Santa Cruz deserted? So sad that it’s deserted! It’s such a lovely area although supposedly people are trying to get together to reopen it on their own, I hope they are successful. Oh how depressing! Yet somehow I’m always attracted to these sites. I’d see this if I was there. It’s definitely worth seeing and the drive is so scenic, when it was a hotel it must have been a lovely place to stay. I love ghost towns, it’s a totally surreal experience to wander through deserted buildings. Love the desat technique. Really makes this post moody in the right way. I just happened upon this post while I was looking for pictures of the Molokai Ranch. My husband and I stayed at this hotel during our honeymoon in 2006. It was the most amazing place, and I was so sad to hear it closed! I love Molokai…it’s so tiny and authentic. Maunaloa is not a ghost town. I was there in May and bought some things from the kite shop. It was not busy, but remember there is not a single traffic light on the whole island.